INDEED, not all heroes are dead or wear capes. Some are out there in the jungle risking their lives to fight the state’s enemies while some are on the streets acting as the gatekeepers to protect the people from terrorist attacks that will happen in their area. Ever since Former Task Force Davao (TFD) commander Colonel Nolasco Mempin bravely accepted the post to lead the armed forces here, he already inculcated in his mind that this assignment would be a very challenging one considering that Davao City is the hometown of President Rodrigo Duterte. He became the TFD commander in August 2017 after he replaced Colonel Erwin Bernard Neri, who served as commander for a year. He was formerly designated as the chief of Governance and Strategy Management Office of the 10th Infantry Division (ID) and commander of the 78th Infantry Battalion under the 8th ID. “I can vividly recall the marching order of City Mayor Sara Z. Duterte-Carpio to me — ‘don’t sleep, don’t breath, don’t embarrass me.’ The success of Task Force Davao is measured by having a zero terrorism incident in Davao City,” Mempin said during the Change of Command Ceremony on Thursday, March 28. Originally from San Miguel, Bulacan, Mempin came from a meager family with his father a carpenter living at the farmland. Mempin enrolled in the Philippine Military Academy (PMA) to earn a scholarship. With perseverance and dedication, he graduated as the top eight among the 147 of “Bigkis Lahi” Class of 1990. Mempin, who has been in the military service for 33 years, is grateful to be assigned in Davao City because of the high regard of the Dabawenyos to the soldiers, support of the local government, and the cooperation of various stakeholders in their security campaign. “In Davao City, people give a high respect to military especially TF Davao. It is a highly urbanized City which requires intricate security protocols. Dabawenyos are very supportive and cooperative to TF Davao. Everyone gives their humble share in keeping Davao City safe and secured,” Mempin said in an interview. Whenever there are major events in the city, expect that he is in the streets to monitor the troops. The moment he chose his profession as a soldier, he already accepted his fate of being away from his family. He was forced to live away from his four children and his wife, Anna Marie. Thanks to the internet, he still has constant communication with them. His family usually visits him here. Mempin said the most challenging part of his job is ensuring that there will be no terrorist attacks that will occur under his watch. He strengthened their anti- and counter-terrorism units in a bid to thwart security threats. In leading his team, Mempin said he strikes a balance between mission accomplishment and welfare of men. He wanted to be remembered as a good and professional leader. Among his accomplishments are the apprehension of 124 drug suspects, 18 persons for possession of illegal firearms and explosives, the recovery of 25 assorted illegal firearms, confiscation of 17,971 illegally cut lumber, and confiscation of illegal drugs with a total estimated street value at P5,232,500. With this, the city mayor has given him a perfect 10 for his performance as the TFD commander. 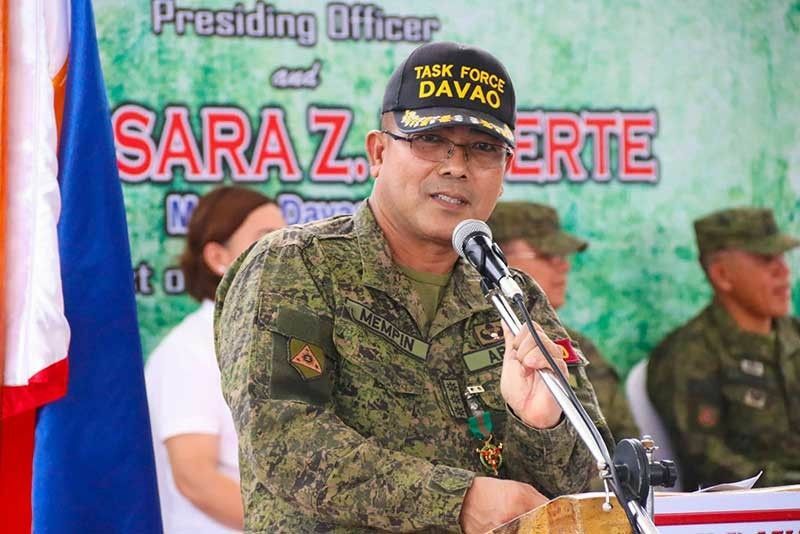 Though Mempin will not be leaving Davao yet, he will be facing a bigger responsibility after he officially took over the leadership as the 1003rd Infantry Brigade commander, which covers the area of Davao City and parts of Davao del Norte.